After J. Irwin Miller finished his studies in Philosophy, Classics and Economics at Oxford in 1934 he went to work at the family business in Columbus, Indiana. The firm, Cummins Inc, manufactures motors. Columbus was a tiny town then. (Currently only 45,000 inhabitants). Miller knew that in order to attract and keep top talent in engineering and management, he had to get involved in town politics, in creating excellent schools and in architecture. He even had to build a house for himself where he could entertain the company’s executives, since there wasn’t a decent restaurant in the area where he could throw a Christmas party. The Miller House, designed by Eero Saarinen and built in 1953, is an architectural gem and has its own tour. 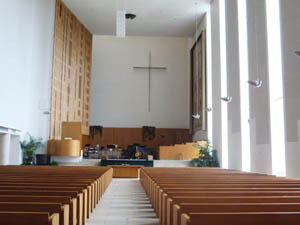 The first building Miller commissioned was the First Christian Church, in 1942. He hired Eero’s father, Eliel Saarinen (1873-1950), a Finnish architect who by that time was well established in this country. 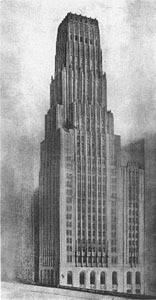 Saarinen had won the second prize for his entry in the Chicago Tribune design competition of 1922, a design whose influence is evident in many skyscrapers built in the 20’s in American cities. Saarinen was a modernist: let’s do without ornaments, please! He was also an architect with visual wit and courage. Just picking a modernist to design a church in rural Indiana was itself an act of courage. How did Miller get away with this?! Must have been his wealth, the reputation of his company and his convictions about the power of art, architecture and modernism. 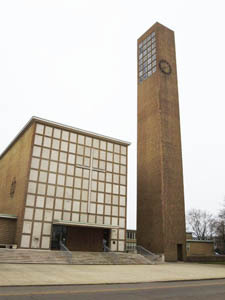 The church that Saarinen designed looks more like a factory or an athletic center than anything the Hoosiers would have associated with their Christian tradition. 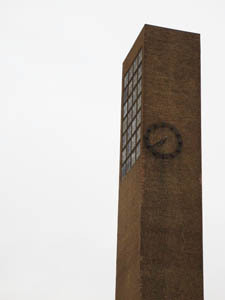 Instead of a steeple, there’s a square brick clock tower! But then comes the really good part: the clock is placed off-center on the tower. I took the architecture tours in Columbus last November and when I saw this (it was the first building on the tour) I just lit up. Asymmetry! First you see the whacky clock and then the tour guide makes sure you also notice that on the building itself there’s a cross that is also off center. 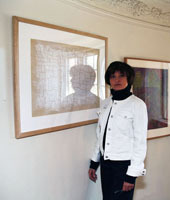 It was part of her job to point this out, but she wasn’t thrilled by asymmetry, that was clear. I was. Inside the church, the altar wall is blank except for a large thin metal cross that is also, you guessed it, off center. Not only that, it’s off center to the right, which hits you with an extra frisson. The reason altars are traditionally symmetrical is that symmetry conveys stability: nothing changes here, don’t worry, you’re safe and comfortable among like-minded neighbors. Saarinen’s design says, not so easy, folks, there’s work to be done in our thinking, our politics, our society, and you are the ones who have to do it. Miller’s depth of political and social thought came to the fore a bit later. In 1950 he co-founded the National Council of Churches. He was involved in civil rights legislation and the March on Washington. He led religious delegations that met with Presidents Kennedy and Johnson to push for the legislation that became the Civil Rights Act of 1964. Learning about this did not surprise me, because I had seen Saarinen’s asymmetrical clock and his placement of the cross. The result? This little town in southern Indiana offers an architecture tour with sixty-one modern buildings, fifteen modern sculptures and two modern bridges. Just to drop some names: Harry Weese, Richard Meier, Kohn Pederson Fox, Cesar Pelli, Eero Saarinen, Eliel Saarinen, Kevin Roche, I.M.Pei, and Ralph Johnson. 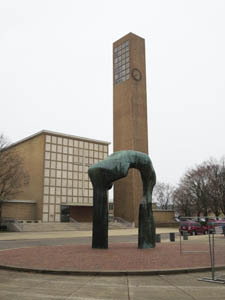 You’ll recognize the sculpture in front of Saarinen’s asymmetrical church: Henry Moore. Well, I’m planning on going back for my own tour at my own pace.